Making a turkey can be an overwhelming task. There are so many different methods and opinions on what makes the best bird. I have always been a fan of brining the turkey. It may take a little extra time and effort but it makes for one juicy bird. 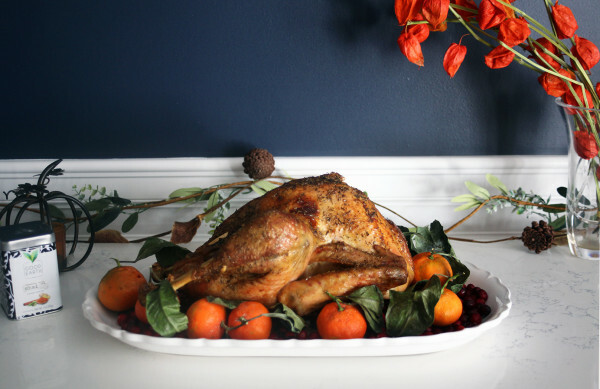 Brining a turkey helps it become saturated in flavor. Thinking outside of the box this year I decided to try to brine a turkey in tea. I took inspiration from Good Earth Teas Turmeric Chai blend. Using the brewed tea rather than just relying on plain water to submerge the turkey really elevated the flavor. I also used some in the bottom of the roasting pan for gravy purposes. The herbs and spices I used complimented what is already in the loose tea. This gave the turkey a unique flavor. My family was so excited over the change in pace! This recipe is based on 7-9 lb turkey. If you are going with a larger bird you will have to adjust the recipe accordingly. The amount of brine to submerge the turkey will need to be increased as well as the cook time. This post has been done in partnership with Good Earth Tea. All recipes and opinions are my own.